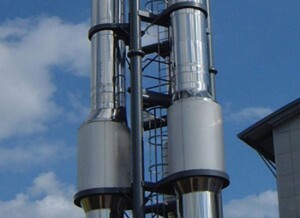 Flues & Masts | Pak Plant Ltd. Larger scale chimney flue systems may require the additional support of a chimney flue mast system. Sometimes , the energy centre or boiler houses are located too far away, or are not built high enough to ensure the chimney flue can be securely attached to a building. The height of the chimney may also require additional structural support to withstand wind loads and other environmental and safety considerations. We can provide freestanding single column masts. The building of supported masts and open lattice masts are individually designed and manufactured to take into account the individual needs of each project. All our mast systems are designed by skilled professionals and fabricated in-house to comply with all associated regulations and quality accreditations. We always work closely with the building architects and designers to ensure the structure is fully functional yet still aesthetically pleasing.